WASHINGTON -- ecretary of State Rex Tillerson declared Wednesday he never considered abandoning his job as President Donald Trump's top diplomat, disputing what he called "erroneous" reports that he wanted to resign earlier this year. He was less emphatic on whether he called the president a "moron," pointedly dodging all questions on the matter. Thrust into the spotlight under uncomfortable circumstances, the normally camera-shy Tillerson sought to rebut a widely disseminated NBC News story that claimed Vice President Mike Pence had to talk the former oil man out of resigning over the summer, and that Tillerson had questioned Trump's intelligence. The explosive claims followed several instances in which Trump and Tillerson's policy pronouncements have appeared to clash. "There has never been a consideration in my mind to leave," Tillerson told reporters in an unusually personal address from the State Department's staid 7th-floor Treaty Room outside of his office. Even before Tillerson spoke, Trump offered support and denounced the report as "fake news." Trump's administration already had seen an unprecedented wave of departures, including a chief of staff, a national security adviser and a Cabinet secretary. However, his core national security team - Tillerson, Defense Secretary Jim Mattis and his second national security adviser, H.R. McMaster - has been viewed by Republicans and even many Democrats as a pillar of stability in an otherwise chaotic government. Even so, Trump has at times appeared to undercut Tillerson's message on some of America's most sensitive national security challenges, including Iran and North Korea. Tillerson also has publicly complained about the White House blocking him from making key appointments. While praising Trump's foreign policy on Wednesday, Tillerson raised eyebrows by pointedly declining to deny he had called the president a "moron" after a contentious meeting at the Pentagon in July. "I'm not going to deal with petty stuff like that," the former Exxon Mobil CEO said. "I mean, this is what I don't understand about Washington. Again, I'm not from this place, but the places I come from, we don't deal with that kind of petty nonsense." "Let me tell you what I've learned about this president, whom I did not know before taking this office," Tillerson said. "He loves his country. He puts Americans and America first. He's smart. He demands results wherever he goes, and he holds those around him accountable for whether they've done the job he's asked them to do." Pence backed up Tillerson's account, saying the two men never discussed the "prospect of the secretary's resignation from the administration." "Any reporting to the contrary is categorically false," Pence's statement said. NBC said Tillerson had been on the verge of resigning this summer amid mounting policy disputes with the White House. It said the tensions came to a head around the time Trump gave a politicized speech in July to the Boy Scouts of America, an organization Tillerson once led. The network claimed Pence, along with Defense Secretary James Mattis, convinced Tillerson to stay. A person familiar with conversation also disputed that the vice president sought to coax the secretary of state into not quitting. 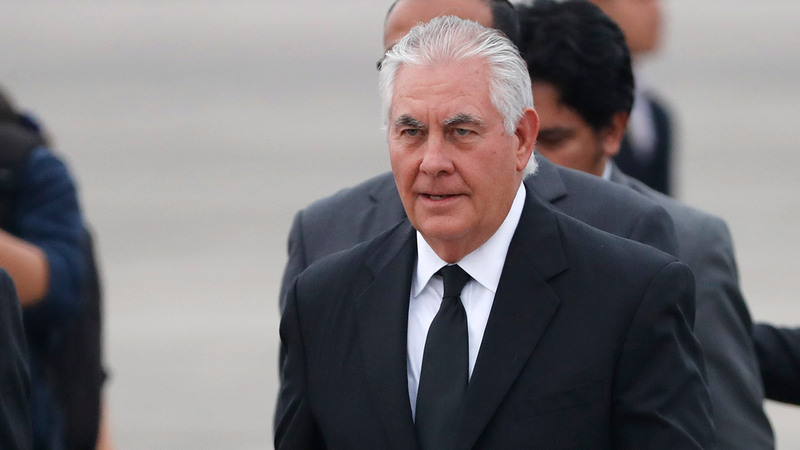 The discussion instead focused on easing tensions between Tillerson and the White House and finding a way for him to operate better within the Cabinet, said the individual who wasn't authorized to speak publicly on the private discussion and demanded anonymity. "The NBCNews story has just been totally refuted by Sec. Tillerson and VP Pence. It is #FakeNews. They should issue an apology to AMERICA!" Trump tweeted. Aboard Air Force One, White House Press Secretary Sarah Huckabee Sanders told reporters that the president still has confidence in his top diplomat. "As we have said many times before, if the president doesn't have confidence in somebody they will no longer remain in their position," she said. Tillerson sought to broach the story in the typically somber and methodical manner he has approached being secretary of state. He framed his response as a defense of Trump's entire "America First" foreign policy, and his own place within that strategy. He also noted the diplomatic successes of Nikki Haley, Trump's U.N. ambassador, with whom he has been privately clashing for several months. "President Trump's foreign policy goals break the mold of what people traditionally think of what is achievable," Tillerson said. "I have answered that question repeatedly. For some reason, it continues to be misreported," he said. Sen. Bob Corker, the Republican chairman of the Foreign Relations Committee, said Tillerson "is in an incredibly frustrating place." Corker, who has criticized Trump's leadership, told reporters that Tillerson "ends up not being supported in the way that I would hope a secretary of state would be supported." Corker said Tillerson, Mattis and White House Chief of Staff John Kelly are "those people that help separate our country from chaos."